Being is uncreated and imperishable, whole, unique, unwavering, and complete. Parmenides (fl. early 5th century BCE) was an ancient Greek monist philosopher born in Elea, a Greek city on the southern coast of Italy, and founder of the Eleatic school of philosophy. The single known work of Parmenides is a poem which has survived only in fragmentary form, in which he argues that Reality is One, change is impossible, and that existence is timeless and uniform. You must learn all things, both the unshaken heart of persuasive truth, and the opinions of mortals in which there is no true warranty. It is indifferent to me where I am to begin, for there shall I return again. The only roads of enquiry there are to think of: one, that it is and that it is not possible for it not to be, this is the path of persuasion (for truth is its companion); the other, that it is not and that it must not be — this I say to you is a path wholly unknowable. Never will this prevail, that the things that are not are — bar your thought from this road of inquiry. Do not let habit, born from experience, force you along this road, directing aimless eye and echoing ear and tongue; but judge by reason the much contested proof which I have spoken. The Greek tradition was a complete contrast to that of the Far East. ...the Greeks placed logic at the pinnacle of human thinking. Their sceptical attitude towards the wielding of 'non-being' as some sort of 'something' that could be subject to logical development was exemplified by Parmenides' influential arguments against the concept of empty space. ...He maintained that you can only speak about what is: what is not cannot be thought of, and what cannot be thought of cannot be. ...more unexpected was the further conclusion that time, motion nor change could exist either. The crisis at the heart of Parmenides' argument, "is or is not," rules out any candidate for an ultimate entity in an explanation of what there is that is subject to coming-to-be, passing-away, or alteration of any sort. Such an entity must be a whole, complete, unchanging unity: it must be a thing that is of a single kind … But it does not follow from this that there can be only one such entity. Parmenides' arguments allow for a plurality of fundamental, predicationally unified entities that can be used to explain the world reported by the senses. Parmenides believed that all Being is what he called the One, and denied absolutely the possibility of change. He believed that the cosmos is full (i.e., no void), uncreated, eternal, indestructible, unchangeable, immobile sphere of being, and all sensory evidence to the contrary is illusory. One Parmenidean fragment stated, "Either a thing is or it is not," meaning that creation and destruction is impossible. From this inheritance contemporary philosophers have continued to draw profit. Parmenides is their earliest ancestor whose work contains explicit and self-conscious argumentation. The severe conceptual difficulties posed for the first time in his verses are of perennial interest, and many of them remain in the forefront of discussion today. Recent study has thus brought his thought, in the words of another critic, "astonishingly close to some contemporary preoccupations." He should be viewed not only as "the most original and important philosopher before Socrates" but as the first extant author deserving to be called a philosopher in a present-day sense of the word. One cannot say that the case for Parmenides is proved. If it is accepted, it is a strange freak of history that so fundamental a discovery should have been made by one for whom the whole physical world was an unreal show. What is clear is that Parmenides is making a conscious attempt at some kind of a new start. Like Descartes, he is trying to find an unassailable starting-point on which something further can be built. This search is understandable, given the intellectual situation of the time. The principles of the Milesians had yielded no one clearly true system, but a number of rival ones — in itself a scandal. Heraclitus had made the whole of cosmology suspect by revealing deep-seated contradictions at its heart. In the background, the Pythagoreans were directly or indirectly stimulating new lines of thought and using them, perhaps, for their own mysterious purposes. As Parmenides categorically threw out all observation with the senses, so this student of philosophy is inclined to throw out Parmenides as a complete waste of time! His static theories denying motion and change were in direct antithesis to the Kinetic metaphysics of Heracleitus, and his depressing monism was later refuted by the atomists Democritus and Leucippus. In a nutshell; in a word; Parmenides is Pah! — and definitely not a philosopher to take to bed with you on a long winter evening! … Personally speaking the whole thing makes me shudder — although I do acknowledge that paradoxes and riddles are very popular with the average thirteen-year-old school boy. Zeno however, impressed his dialectical ability on Socrates, who then began turning it loose on the average citizen in the Agora (market-place) and in consequence made himself most unpopular. I only think that it is a pity that when they asked Socrates to drink the hemlock in 399 B.C., they didn' t include Zeno and Parmenides in the invitation. It was, for all I know, the first deductive theory of the world, the first deductive cosmology: One further step led to theoretical physics, and to the atomic theory. If I accede to Parmenides there is nothing left but the One; if I accede to Zeno, not even the One is left. 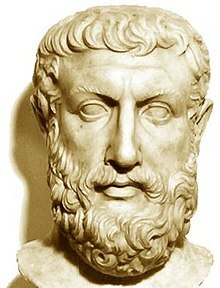 One of Parmenides' merits is to have been the first philosopher who strove to handle general concepts like "being", "not-being", "knowing", "unity", "identity", in their systematic connection. The philosophy of Parmenides is a strange blend of mysticism and logic. It is mysticism, for its goal is not the gradual and cumulative correction of empirical knowledge, but deliverance from it through the instantaneous and absolute grasp of "immovable" truth. This is not the way of techne, but the way of revelation: it lies "beyond the path of men" (B. 1.27). Yet this revelation is itself addressed to man's reason and must be judged by reason. Its core is pure logic: a rigorous venture in deductive thinking, the first of its kind in European thought. This kind of thinking could be used against the world of the senses … This projection of the logic of Being upon the alien world of Becoming was Parmenides' most important single contribution to the history of thought, though it is seldom recognized as such. Without it, his doctrine of Being could have remained a speculative curiosity. With it, he laid the foundations for the greatest achievement of the scientific imagination of Greece, the atomic hypothesis.